OPEN FORUM: SCI 114 (Chemistry Conference Room). 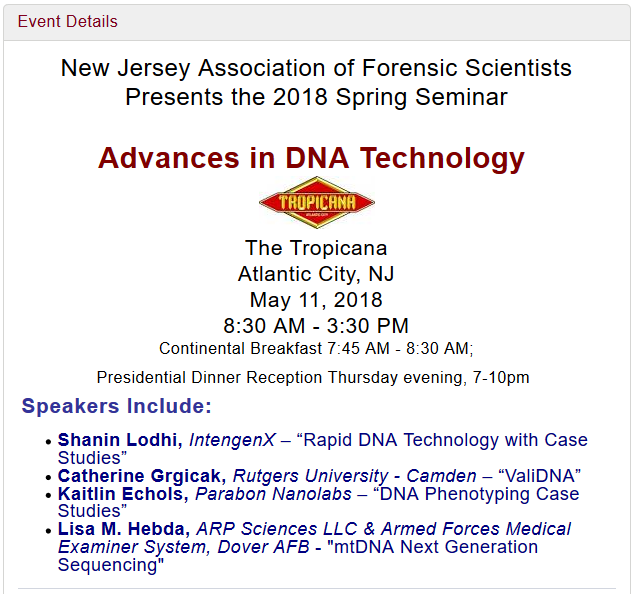 On Thursday April 25th at 3pm, come see Amanda present her work on: DEVELOPING A FORENSICALLY RELEVANT SINGLE-CELL INTERPRETATION STRATEGY FOR HUMAN IDENTIFICATION. In this work Amanda demonstrates that single-cell signal is fundamentally different than signal acquired from bulk-processing, signifying new interpretation constructs are needed for forensically relevant single-cell signal. Laura shows that the information content in forensic electropherograms (EPGs) can drastically be improved by applying a simulation-experimental based approach. She then applies these improved post-PCR laboratory parameters to optimize the pre-PCR process. On Friday March 29, 2019, Dr. Grgicak will speak on topics related to Systems Thinking and the Impacts on Forensic Inference. She shall summarize LFTDI’s work on the development of our computational systems which compute the a posteriori probability (APP) on the number of contributors (NoC) and the likelihood ratio (LR). Notably, she will highlight how the results from two computational systems may be combined in order to procure a complete weight-of-evidence. Last, she shall show how systematically optimizing the forensic laboratory process, using simulation, can improve LR outcomes and stabilize them across laboratories, improving inference outcomes nationally. M.S. level Part-time Research Assistant open to all Plan A (thesis-track) enrolled M.S. or 4th-Year B.S./M.S. Students in Chemistry, Biochemistry, Biology or Forensic Sciences. Data may be used toward M.S. thesis, if applicable. Training in and duties include, nucleic acid extraction, qPCR, PCR, dPCR, Capillary Electrophoresis, Next-Generation Sequencing and Data Analysis. Preferred candidates will have taken, or plan to take, courses in Biochemistry, Bio-analytical/Molecular Biology, Statistics & Genetics. Send C.V. to Dr. Catherine Grgicak at c.grgicak@rutgers.edu, if interested by April 30th, 2019. LFTDI acquires an Ion S5 and Chef NGS system for forensic applications. The technology will be used to build a dynamic model of the entire NGS pipeline, which will be used to optimize the NGS process for efficient and reliable forensic data generation in a cost effective manner. Amanda is the recipient of the Jan S. Bashinski Criminalistics Graduate Thesis Grant, which includes funding for her single-cell forensic research and travel to present her work at AAFS. The award is also accompanied by a plaque presented at the 2019 AAFS Criminalistics Section Business Meeting, Wednesday, February 20, 2019. In her workshop (Sept 24, 2018) at ISHI 29, Dr. Grgicak chairs a workshop demonstrating why a systems thinking approach to validation positively impacts forensic mixture interpretation outcomes. Dr. Grgicak describes what Systems Thinking is, how the PROVEDIt DNA Database came to be, and how her background in physical chemistry drives her research. This workshop introduces systems thinking with demonstrations on applying a systems approach to forensic DNA mixture interpretation, optimization and validation. Topics to be covered include validation of the DNA interpretation pipeline containing probabilistic genotyping software, focusing on current and forthcoming OSAC/ASB and SWGDAM mixture interpretation validation and verification standards and guidelines. Also included will be a review of published literature with discussions on the foundational validity of mixture interpretation and the impact of laboratory accreditation. Future directions for improving front end processing steps will also be discussed. Drs. 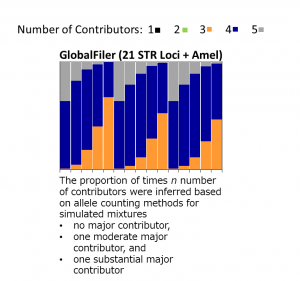 Grgicak and Lun along with Sarah E. Norsworthy publish an article entitled “Determining the number of contributors to DNA mixtures in the low-template regime: Exploring the impacts of sampling and detection effects” in Legal Medicine (DOI: https://doi.org/10.1016/j.legalmed.2018.02.001). We show that capturing all of the information has positive impacts on inference while allele counting methods lead to underestimations.